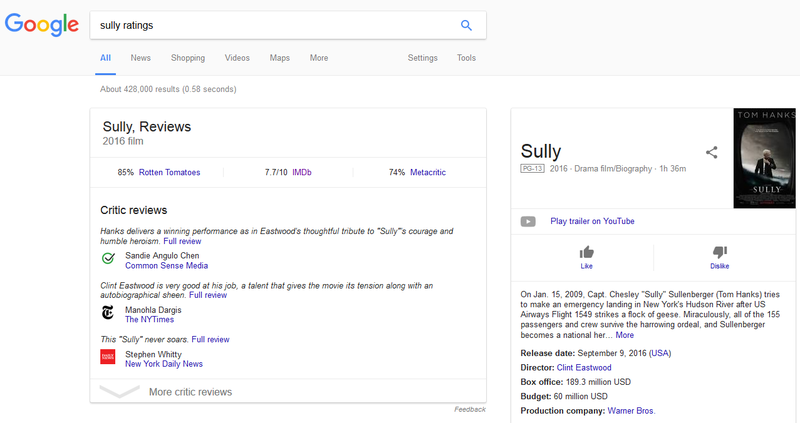 Google has added “Like” and “Dislike” buttons to movie knowledge panels in their search results, as part of the drive to show their own movie ratings, in place of third party movie ratings which have been featured in Google’s knowledge panels for over a year. 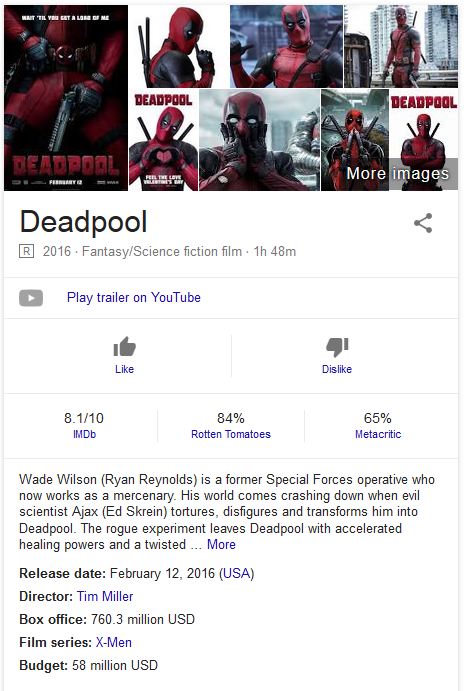 Not all movies seem to show Google user ratings at this time. I can only find movies showing ratings that are from 2015 and 2016 but all movies are collecting the ratings data. 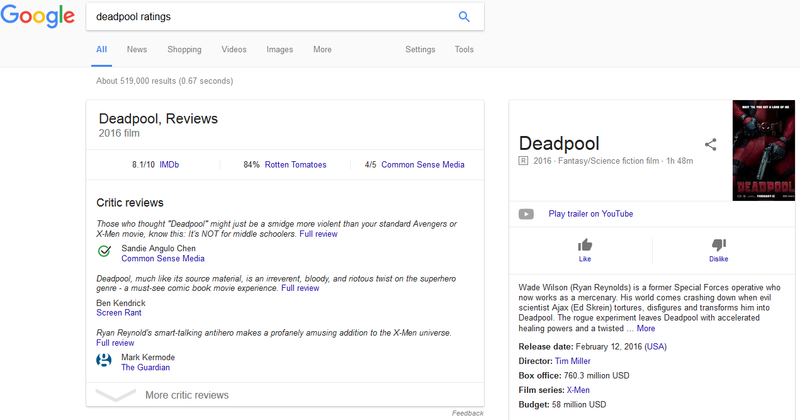 Google is still showing third party movie ratings from IMDB, Rotten Tomatoes and Meta Critic. 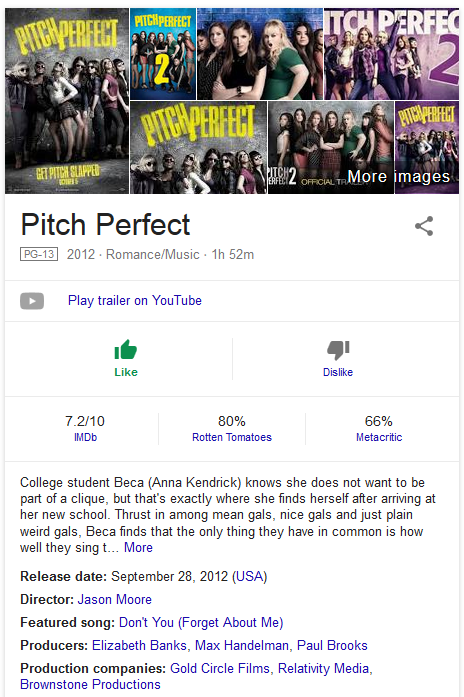 But on movies where they show the new “Google Users” ratings, they drop the Meta Critic ratings. Google only seems to show the Google ratings one in the third spot on the far right position. When you click like to dislike, the thumbs up/down will light up. 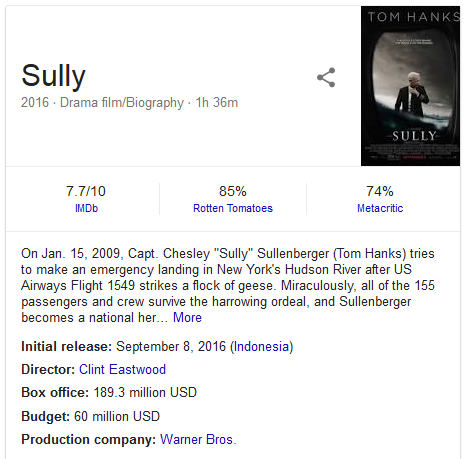 When you do a search for ratings specifically, such as “Sully ratings”, Google doesn’t seem to feature their own ratings yet. Instead, they only show Rotten Tomatoes, IMDb, Metacritic and Common Sense Media, along with the critic reviews below. They still solicit ratings in the knowledge panel on the right though. And another example, this time with Common Sense Media, which doesn’t seem to display in the right hand side version of ratings in the knowledge panel. This is only showing for users who are logged in and only seems to be active on desktop. When you logout, you no longer see the like/dislike, nor do you see the Google ratings. 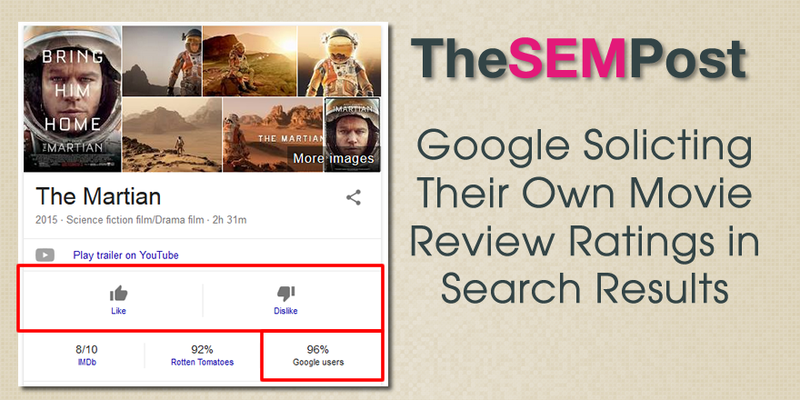 It isn’t clear if Google is soliciting these ratings only from the knowledge panel or if some are coming from Google Play. 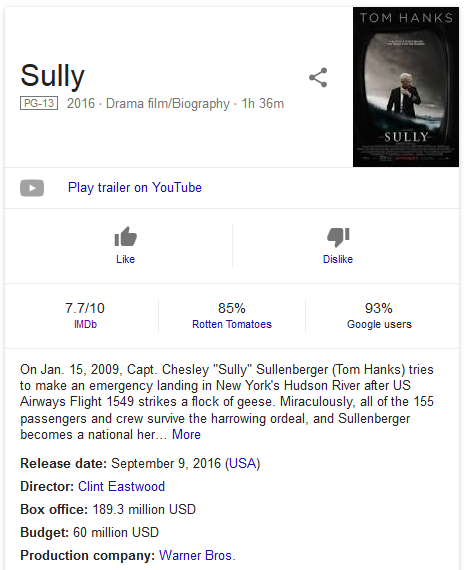 But it would seem it might only be from the knowledge panel, since Google Play shows their own user ratings that either differ from what is displayed in the knowledge panel or Google Play shows movies with ratings that do not show up in the knowledge panel. But Google soliciting their own ratings and displaying those ratings within the knowledge panel certainly makes one wonder if the life of third party rating sites within that panel is limited. 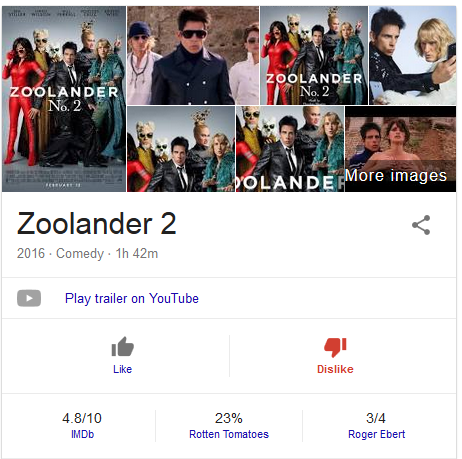 But with the nature of movie reviews often varying, it would make sense for Google to continue showing a variety of ratings. But will the Google version eventually get a more prominent role? 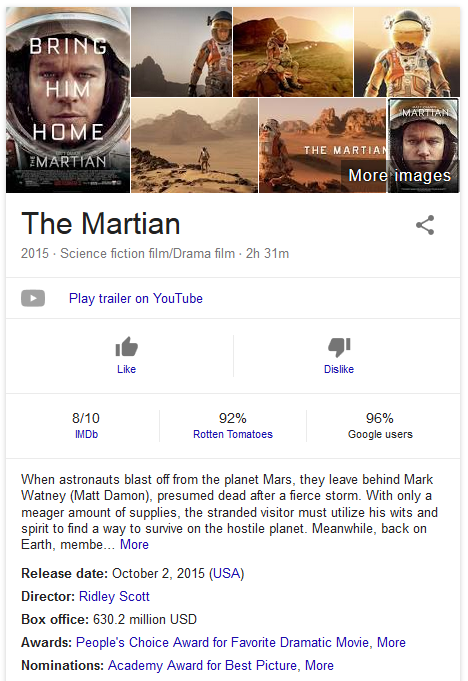 Google first launched ratings in Google’s featured snippets in May 2015 for movies, then in August 2015 added the ratings within the knowledge panel.